After buying the Columbus MAX bike a while back, it kept bugging me that the frame was only partially built with Columbus MAX tubing. Since a new paint job is going to set me back around $200, I decided I wasn't going to settle for a frame that isn't exactly what I am want. That is why I set out to find a better frame for my winter bike project. A couple of weeks after purchasing the Columbus MAX bike I stumbled across a pretty rare Eddy Merckx Corsa Extra bike on eBay built with Columbus MAX tubing. I placed the winning bid and picked it up somewhere near Liège, Belgium. The silly thing was that, although I had always thought that a true Columbus MAX frame would be my dream frame, seeing it in real life made me realize it was not what I wanted. The oversized and ovalized top tube and seat stays just seemed a bit out of place; way to bulky. Now I know why Merckx started using a different top tube and seat stays on his MX-leader frames. So again I needed a new frame. For a couple of weeks I thought a (lo-pro) time trial bike would be cool, just to give the discipline a new try during the winter months. This resulted in the purchase of a Litespeed Blade bike, which didn't look as cool in real life as I had hoped either, and in the purchase of 2 pairs of Spinergy REV-X wheels (700c and 650c), for use on a steel lo-pro frame I came across on eBay. In the end I didn't place a bid on the lo-pro frame (just didn't seem practical/comfortable), so I sold off the 650c Spinergy wheels and I also parted out the Litespeed. On cycling discipline that has always intrigued me is cyclocross. After Googling for steel CX frames, I decided I was going to build myself a steel CX bike. Finding one was a different story though. Frames like the Surly Cross Check can be had pretty cheap, but are generally quite heavy and not very special. There just don't seem to be too many vintage CX bikes around, aside from a couple built with low end Columbus Cromor. 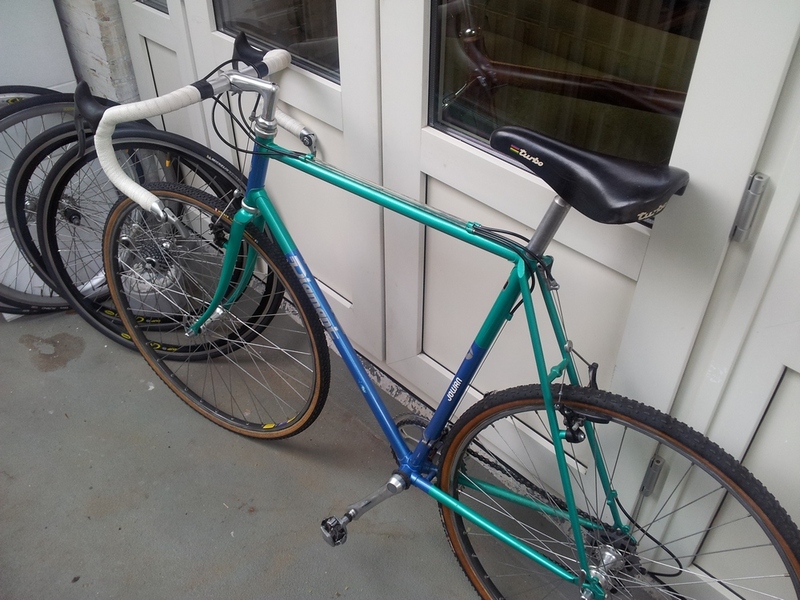 Luckily my patience has been rewarded, because last week I was finally able to buy a true vintage high end CX bike for a great price: a Belgian Diamant. The bike was built for a professional rider, but he retired almost immediately after receiving the bike. Hence, the bike looked almost like new. Frame tubing is Ishiwata EX 4130 triple butted steel. The new plan is to remove the paint from the frame with paint stripper and to do a bare metal finish, possibly with gun blue. The bike was built up with Shimano 600 7-speed parts, combined with an XT rear derailleur and LX brakes. I will be keeping most of these parts on the bike, aside from the cranks and the wheels. The cranks will be replaced by a compact FSA crankset (for the time being) and for the wheels I plan on going with the 700c Spinergy REV-X's. 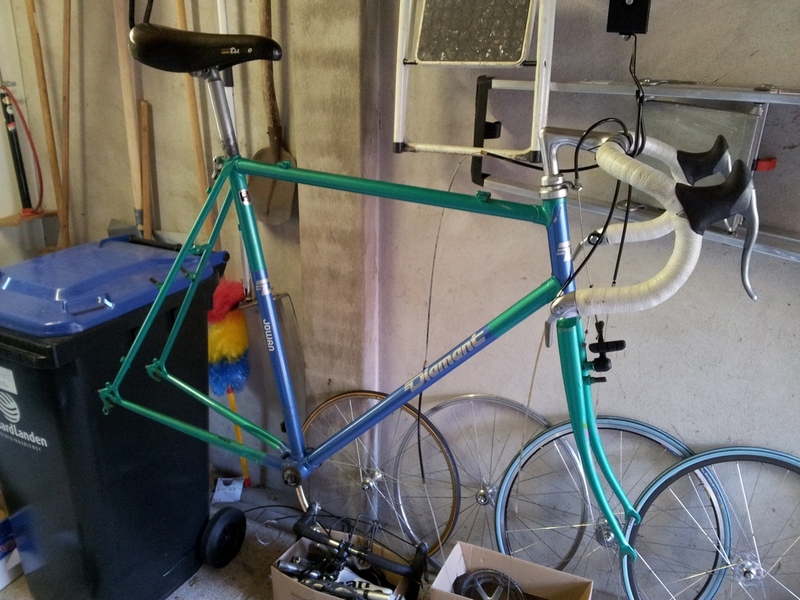 Here are a couple of pictures of the bike and the frame. 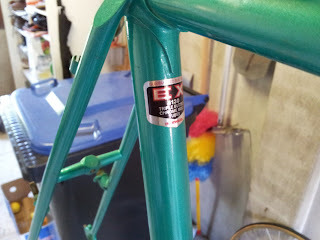 Frame weight (with paint) is 2080 grams. The fork weighs in at 840 grams.